RAM is cheap. Hard drives? Cheap. Big, beautiful LCD monitors? Cheap, cheap, cheap. You may have all the elements of a great video-editing setup, but for one thing: a video-editing application that can take advantage of all that inexpensive hardware. With the new Adobe Premiere Pro CS5 ($799 stand-alone, $1299 as part of Creative Suite 5 Design Standard; prices as of April 12, 2010), though, you'll have all the components necessary to make even high-definition video editing fly. Well, almost all the components. In addition to being 64-bit-aware, Premiere Pro CS5 relies heavily on GPU processing. If you have one of a very select (and expensive) group of graphics cards, the application will greatly speed up rendering and real-time playback, and leave your computer's CPU to handle more-mundane tasks. The 32-bit versions of Windows have been squeezing users: Those OSs can recognize only 4GB of RAM at most, even as applications and Windows itself have come to demand ever-increasing amounts of RAM. On a 32-bit system, once all your startup programs load, you may have little left over to run memory-intensive applications. With the debut of Creative Suite 5, Premiere Pro--along with its companion applications Media Encoder CS5 and Encore CS5, and the separate After Effects CS5--is now 64-bit native. That shift is long overdue (about five years overdue, since Vista came on the scene), but I'm still surprised that Adobe won't even offer 32-bit versions of these applications; you must have a 64-bit OS to run them. When I installed a beta version of Creative Suite 5 on my test system, a dual-Xeon workstation running Windows 7 64-bit with 8GB of RAM, I did not notice a substantial improvement in rendering speed--but then, my workstation doesn't have one of the approved graphics cards. Relying on CPU power, Premiere Pro CS5 didn't render any more quickly than Premiere Pro CS4 did. However, I had none of the RAM-related problems I've occasionally encountered with Premiere Pro CS4--none of the slow reading and writing of data to the hard drive instead of to RAM, fewer playback and timeline scrubbing hesitations, and generally smoother operation overall. As with the 64-bit Photoshop, Premiere Pro requires that you allocate RAM manually--up to a maximum of 128GB. On my 8GB system, the default setup reserved 6.5GB for Premiere and 1.5GB for everything else. However, with only a simple, single-track project open, Premiere used merely 214MB of RAM--it did not take up the entire 6.5GB, and my system ran perfectly well with several other applications open. Only when I started adding several tracks of HD clips and effects did Premiere start gobbling RAM; the highest amount I saw was about 3.5GB. One of the benefits of Premiere Pro CS5 is that Adobe is continuing the trend of using GPU power that it began with After Effects a couple of versions ago. The company says that Premiere Pro can "solve many computational problems in a fraction of the time a CPU would take to perform the same task" and thus can render HD video much more quickly--freeing your CPU to handle "background tasks." If I were Intel, I'd feel insulted by that. That benefit goes only so far, though: Adobe has qualified just five graphics cards for use with Premiere Pro--all of which use nVidia's CUDA technology. Four of the cards are Quadro workstation cards, ranging in cost from roughly $800 to more than $2000; the sole desktop card so far is the GTX 285, which sells for about $400. Only the GTX 285 and one of the Quadros will work in a Mac. SLI configurations aren't supported. Adobe says it will also support new cards from nVidia's Fermi line, such as the GTX 470 and GTX 480, which are supposed to be available this month. Unfortunately, while those cards are coming out soon, Premiere won't gain GPU-acceleration support for the GTX480 until the third quarter of this year, and Adobe hasn't said anything yet about the GTX 470. Premiere's Effects Browser now has three buttons at the top of its window--one that filters the list to show only GPU-accelerated 32-bit effects, one that shows only CPU-accelerated 32-bit effects, and one that shows only YUV color-space effects. The filtering is particularly useful because if you mix 32-bit effects and 8-bit effects, they'll all render in 8 bits. Also, the accelerated effects are a bit of a tease--they are available for use only if you have one of the supported graphics cards installed, but they show up whether you have an appropriate card or not. Mixing Macs and PCs in the same shop? Premiere Pro can now share projects and assets with Apple's Final Cut Pro, and with Avid editing applications. If you use only common effects and transitions, you may be able to do so without converting or even rendering--though you will still have to worry about how to share the gargantuan source files.When you import or export a Final Cut Pro project, Premiere will generate a translation report that details how effects, transitions, and other elements got carried over from one platform to the other. For example, you'll see notes like, "additive dissolve not translated; cross dissolve used instead." Native support for massive R3D files generated by RED Digital Cinema cameras is new, as well as support for XDCAM HD 50, AVC-Intra footage, and HD video from some Canon and Nikon digital SLRs. For example, I imported HD video from a Nikon D5000, and Premiere required no conversion at all--I just dropped the clips into the source bin, and, from there, immediately into the timeline. Similarly, Premiere will now import unprotected asset files from a DVD, also with no fuss. A new tool finds gaps in videos on your timeline, and another lets you output a still frame from your video with the click of a button. The latter function makes it much easier to generate a thumbnail image for your Website. 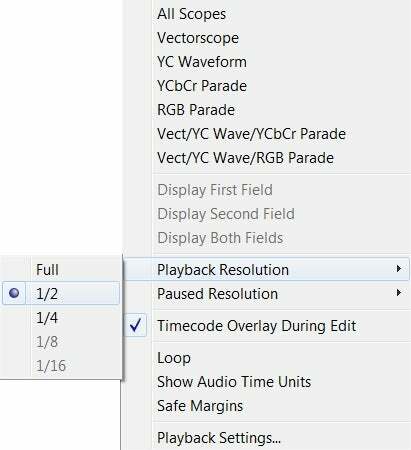 You can now set monitor playback resolution and pause resolution independently by using a simple drop-down menu; that's useful if you're editing on an underpowered system such as a laptop. But as with many Adobe applications, Premiere's interface text is very tiny, and you can't adjust the text size. Later this year Adobe will release a set of online services called CS Live; some of these services will integrate with Premiere Pro and/or other elements of the Production Suite. For example, Adobe Story allows you to develop scripts, characters, and story lines and collaborate on them with other folks online, setting things like scene duration and shot numbering, and you can tag nearly every element in your script. Later, you can bring that information into Adobe OnLocation (which comes with Premiere Pro) to generate shot lists, and then when you import the project into Premiere, the in and out points and the metadata come with it. A link in Premiere's File menu will launch Adobe Story so you can check whether your production is adhering faithfully to your script. Then, you can upload your production (in low resolution) to another online Adobe application, CS Review, where others can make comments on the production; the comments then appear in Premiere Pro's new Review panel, and the comments appear at the exact points that reviewers want them to appear. The online services are supposed to go live later this year, though Story is already available as an Adobe Labs beta. Adobe's with-both-feet move to a 64-bit-native application is a bold one, and a move that other developers are sure to follow. But beyond that, it strikes me that Adobe is, at least inadvertently, promoting a professional video editing environment similar to that of the early to mid 1990s, when those who wanted to edit analog video on their computers had to have $3,000 video cards in their computers. Sure, 64-bit computers have become relatively common, and regular folks will be able to use one with Premiere Pro to create great video productions, as long as they're willing to wait. If video editing is your job, you know that time spent rendering is money not earned or projects not completed, and for you, investing in this application and one of those expensive nVidia cards is practically guaranteed to speed up your workflow--and your cash flow.